Drafting and design studios with the latest equipment, student exhibition spaces, as well as a computer center and library with Internet access and inter-university research programs all facilitate learning and creativity in an air-conditioned setting of comfort and beauty. 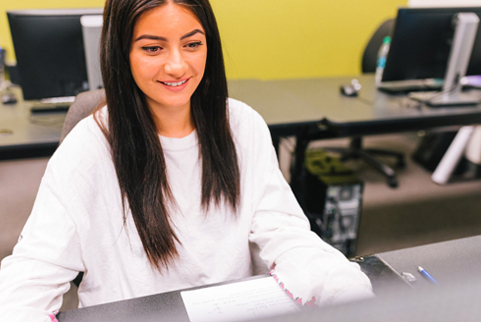 The Institute also offers a student lounge and plenty of convenient parking, and administrative offices where students may seek personal help and attention. Our extensive library includes the most recent books, periodicals and information on interior design, architecture and general subjects. And, especially for student use, there are several resource areas with hundreds of the most current samples of fabric, wallcoverings, carpet and tile. Right in the heart of Orange County, CA Interior Designers Institute is conveniently located in Newport Beach, between Los Angeles and San Diego, close to many of the major interior design centers, retailers, showrooms and manufacturers. Within close driving distance, there is easy access to fine restaurants and cultural attractions. Newport Beach is often compared to the South of France with its beautiful beaches and charm. Balboa Island is in close proximity, as well as the famous artists’ community of Laguna Beach. World-class shopping is nearby at South Coast Plaza and Fashion Island. Or, a student may prefer a night of opera at the spectacular Orange County Performing Arts Center. Angel Stadium of Anaheim, home of the Angels, Disneyland and Knott’s Berry Farm are all just an easy drive away. The Institute has added a new facility to its campus for use by all students. Just a few minutes walk from the main building, it houses a new Student Center, as well as a computer lab with the most updated equipment and new classrooms. All instruction takes place at 1061 & 1071 Camelback Street, Newport Beach, CA 92660. At Interior Designers Institute you can attend an interior design school surrounded by activities, art and entertainment.